Suggested Citation: Kerr, Andy. 2000. Oregon Desert Guide: 70 Hikes. Seattle: The Mountaineers Books. p 200. The Owyhee Uplands are a broad undulating plateau cut deep by canyons such as those of the Owyhee and Malheur Rivers. The ecoregion continues into both Idaho and Nevada. The elevation ranges from 2,100 to 6,500 feet, much at an average of about 4,000 feet. Spring is wet, summer scorching, autumn perfect, and winter cold. Most moisture falls in the form of snow. Though a "Great Basin" desert type, the topography is remarkably different. It is not basin and range, hut canyonlands. The welded tuffs yield glorious rock formations reminiscent of Utah's Colorado Plateau. Notable are the volcanic soils that derive from the underlying deposits of basalt and rhyolite. Of particular interest are the soils that come from welded tuff and volcanic ash, such as at Leslie Gulch, Succor Creek, the Rome Cliffs, and other locales. 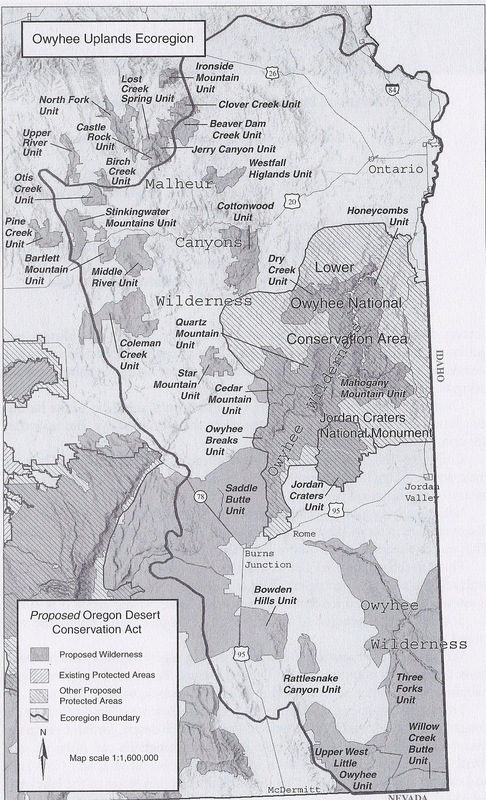 Plant communities in the Owyhee Uplands include big (Wyoming and mountain) sagebrush, low sagebrush, black sage, salt desert scrub, and mountain mahogany woodlands. Riparian forests, including massive cottonwood gallery forests at the confluence of the Snake, Malheur, and Owyhee Rivers, have mostly given way to agriculture and urbanization. Magnificent Great Basin wildrye and needlegrass communities supported by the deep soil along river bottoms have essentially disappeared. Juniper can also be found, but far less abundantly than in most of the other ecoregions of the Oregon Desert. The Oregon Biodiversity Project has estimated that 2.1 percent of the ecoregion is adequately protected to conserve and restore biodiversity. Given the lack of roads (especially paved ones), the Owyhee Uplands of Oregon, Idaho, Nevada, and Utah is the wildest region in the Lower Forty-Eight states.